Welcome to Dog Behaviour Advice, feel free to take a look through our large selection of dog training and obedience articles. There are many articles on every aspect of a dogs behavior from training a new puppy to dealing with aggressive dog behavior. Don't be driven barking mad, learn about your dogs behaviour from a professional dog trainer! "I am sorry to announce that the creator of Dog Behavior Advice articles Alan has passed away towards the end of January 2008. He will be missed by many, but always remembered for all the advice he has given people over the years helping them with their dogs behaviour problems. He will be sorely missed." Regards, Aaron - Dog Behaviour Advice - The Dog Advice Site admin. "Alan, who lived in Javea on the Costa Blanca, sadly passed away last week and was cremated Friday the 25th January 2008. Alan will be remembered for his many contributions to the dog world, in general and from his discussions on local radio stations and his articles in the local media. He worked with dogs for over 40 years alongside the North Yorkshire Police, he attained the highest standards of control with his methods of using the most efficient and humane methods available. His passion for all things dog, was not only infectious and knowledgeable but will be greatly missed by many. 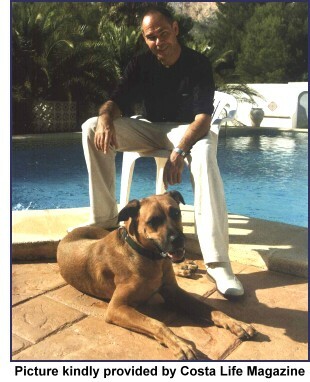 He will be sadly missed by his wife and friend Anita, family, friends & colleagues in the canine world. May he rest in peace and enjoy the long winding walks, on the clouds with all his canine and human friends."